Friday was a wonderful closing day to camp. It is always bittersweet; so hard to leave the kids you’ve grown to love over the week, and so grateful for what was accomplished there. There was quite a surprise for the coaches and kids of the first camp at the AMG School. The management of the National Gym gave permission for the coaches to have their last day of camp there in the gym. When the kids got off the bus and ran to the entrance, they were in awe. A few may have been inside the National Gym, but most likely none had been down on the floor of this amazing facility. The privilege of holding camp there was huge. The kids were so pumped! They put more effort into every drill than ever before. Shawn led them through competitions and stations and ended with the all-time favorite, Last Second Hero. The award ceremony was a little rushed, as the facility was also used for soccer practice, so our camp had to move slightly to another area of the court. The kids who received awards were thrilled, and everyone went away with a basketball of their own and a certificate of participation. After lunch, the coaches began the second camp in the rural area with Coach Estuardo. It was again a great time of fun on the court, followed by awards and the presentation of basketballs and certificates. Coach Estuardo presented our coaches with a key chain and a Guatemalan flag pen; gifts from the heart. We presented him with the remainder of the basketballs to be used for his time with the children, and a sack pack. They hope people will come alongside him to help him. He’s doing so much of this on his own. The team traveled back to the hostel in Guatemala City to rest and have dinner. They would pack up that night so everything is ready to go the next day. Then on Saturday morning, they would travel to Antigua for the day, sightseeing and enjoying a well-deserved day of rest together. They will return to the hostel at the end of the day, grab their luggage and head to the airport for the journey back home. They should arrive in Houston at 5:00A Sunday morning. Thank you for your support for this team of coaches, the local coaches who served with them, and for the kids who were challenged to find their Purpose, Plan, Place and Part. The team did a community walkthrough to understand the needs of the kids they work with and their families and community. A social worker who went to the local school and is now working for them said his favorite part about that school was how much of a family the staff and students are. We went to a different private school which goes through a full high school, for a one time camp. We worked with 13 boys and 7 girls on the basketball team. Kids were very receptive and the coach was as well to allowing us to work with them. They had a good amount of athletic ability, and we ran offensive and defensive drills to develop their skills. In Camp 2, the kids had high energy, which was expected for the third day. They had a lot of fun. The coaches were all tired after the morning practice, but did a great job of pushing through and being flexible to make it a great camp. Shawn gave the report while the coaches were waiting on their dinner. They were back at the hostel for the evening and the Guatemalan coaches had ordered Chinese food for our coaches. After dinner they were going outside for fellowship around a campfire. The morning camp was a blast. This was the fun day, so they skipped stations and contests and played games. The energy level was higher than Shawn could remember seeing before. Maddy and Josh had their teams (youngest girls and youngest boys) chanting their team color at every turn. It was great! And they finished with Last Second Hero, which is always a winner. In the afternoon, the kids had a school function they could not miss, so our coaches led practice for the Girls’ Under 16 National Basketball Team! What a privilege! Sarah had talked with their coach in advance and had asked for areas he’d like them to work through. He gave our coaches his blessing to run them through anything they wanted for 2 hours. Sarah ran them through the drills and did a great job. Braya and Tara worked with them as well. This team really came together well. Braya and Tara are D1 athletes and were able to speak to the young national team from their life experiences. It was an amazing experience. One of the stories the lead coach shares on Day 3: I Have a Part, is about Richard Hurd and the 5 overtime Baylor/A&M game. When the camp split into small groups, one young camper asked if they could talk about Richard Hurd’s health. He had been moved by the story and was concerned about the man. Precious. Rich did an awesome job of encouraging the team in the morning. Everyone got to bed late the night before and their bodies were tired from the first day of camp as well as traveling. He reminded them that the strength in us is most powerful in our weakness, even with conversations with the kids in team time. What the coaches say to their kids will be effective because of the Truth in us. They just need to be present and active and not worry about the rest. Powerful encouragement! All this after a good breakfast of course! The AMG School where the first camp is held is doing a great job with their students. They are so attentive to their coaches and give their all in an effort to learn. In fact, the coaches were quite surprised at how much the kids had improved overnight. They would guess the kids went home and practiced the rest of the day in order to make that much of a difference. They are well behaved and a delight to work with. After the first camp was over, it was time for local coach training. They worked hard on defensive drills and offensive positions. It’s really rewarding to see them participating in each drill, sincerely wanting to understand more so they can teach their kids well when we’ve returned home. There are 2 coaches from last year’s camps, and the others are new. The local and HFH coaches have bonded like they’ve known each other for years and are instant close friends. The HFH team has also bonded well, working hard together as a team, exactly as it is meant to be. Shawn says that they have laughed more as a group than any group he’s worked with. They are enjoying the jokes Steve is playing on them as well. In the afternoon camp, there were fewer kids, down to 32. They learned that there was no meal from the facility that day, which probably would account for the difference. The kids who did attend had a great time. It’s obvious that they are absolutely loving every minute of camp. They have never experienced anything like this before and it shows. But after the abbreviated camp's activiies, they are exhausted. Afterwards, the coaches walked through the community and again went into homes of their campers. Shawn and his group went into the home of the first kid with Coach Estuardo. The mother shared how much her son had grown in the last 8-9 months of working with Coach. She could tell how he was growing in his love for others. The HFH coaches did a great job of sharing, blessing and encouraging the families they visited. Coach Estuardo has blessed our team greatly these last two days. He brought a loaf of bread and gave it to the team on Monday, and yesterday he brought smaller individual loaves of bread for the team. He loves others so well. The team finished with dinner back at the hotel, sharing stories of the day, preparing for the next day, and of course, laughing. The team started the morning with a hearty breakfast of eggs, toast, beans, fried plantains and fruit. Yum! The first camp is at the AMG school, the one we worked with last year, and the structure was basically the same. There were 61 campers there, eager and excited to begin. The boys and girls were fairly evenly distributed, putting at least 9 on each team. The new coaches were great and became part of the high energy, fast paced and encouraging camp we bring. Sarah did a great job being creative in the contests, making it possible to carry out many of those at the same time on the small court. Our coaches are training the local coaches in the game of basketball, so that when we return home they can continue teaching the kids. Some are new coaches to basketball and others are more familiar with the game, but everyone is learning. Sarah took the lead on teaching them defensive drills, very different from soccer they are all familiar with. After lunch of chicken or pork, rice, tortillas, fruit and veggies at the place where the team stayed last year, they boarded the van and rode for 45 minutes away from the urban school to a poor, rural community. Their contact there is Coach Estuardo, who partners with the local organization. They provide 100 lunches for the kids daily, and Coach opens the gym twice a week for practice. He has been wanting help in awakening the need for more active sports in this community. Although the time with these 44 campers was shorter than our typical camp, it was good. There were 12 girls and 32 boys. After camp, the coaches (HFH and local) walked through the neighborhood and saw where 2 of the kids lived. They walked up a 500’ incline where another one lives. The mom had just given birth 3 days ago, so only our 4 female coaches were allowed to go inside. They visited with the mother and baby, and spoke blessings over the whole family. Four of our male coaches went into another home and visited with them. It was a sweet thing to be invited into their homes. After dinner at another mall in Guatemala City, the tired team returned to the hotel for the evening. Everyone is healthy and doing well, although one coach may have a hard time getting to sleep after drinking 2 cups of coffee at dinner (she was feeling alive)! We ask for continued connections with the campers in both the morning and afternoon camps, for continued health of the team, and for continued awesome weather. The team has arrived safely in Guatemala, along with all their luggage! We are grateful for the protection over them. Carlos and Carlos picked them up from the airport and took them to their hotel, where they're enjoying a delicious lunch. Everyone was hungry! After lunch, they will watch a documentary about life there. They'll get cleaned up from travel and rest for a while before dinner. We're looking forward to a great week! Team Members L-R: Jason Maddox, Shawn Horan, Laurie Wible, Mark Wible (leader), Sarah Ellingson, Kate Pruett, Grace Kim & Joey Sauser. This is the report from Friday, given by both Mark and Shawn. Today was great! They started the day off with another great breakfast of eggs, fried or scrambled, with salsa. Joey did a great job sharing with the team this morning. He talked about the injustices they’ve seen this week and reminded them in whom they trust. They are to be confident in what will be accomplished through them this one last day with the kids. Before camp they visited the school where most of the current campers attend. A teacher from the school, who grew up in the same area, walked them through some of the communities where the students live. It literally is across the street from the 2nd largest dump in the Western Hemisphere, built on top of the former dump. The people who live there started out as squatters. They are now organized into Colonias (neighborhoods) with about 300-400 people living in them. There are no bathrooms. No running water. They get their water from 55 gallon barrels in the neighborhood square. Flies were abounding. Tin houses with bed sheets for doors. It was sobering. They began camp a little late but with a fresh attitude of loving on the kids. The kids did much better today than yesterday afternoon; getting some rest seemed to help them a lot. They had a lot of fun with shooting competitions and last second hero. Sarah led mass ball handling and did a great job. Shawn took over from there and ran the rest of camp, again doing a great job. The closing ceremony was wonderful as these kids won medals, got certificates and balls, and just shared smiles and hugs as they said their goodbyes. One little girl was so precious when her name was called as a medal winner. She could not believe it. Her mouth dropped open and she sat in stunned silence for about 10 seconds before it registered she was supposed to come up and get her medal. She later told her coach Kate that before this camp she never thought she could do sports or anything else right but because of the encouragement to work hard and believe she received at camp, she now believes she can do anything! Breakfast of eggs, chorizo, pancakes and fruit, got the team out the door and on the way to the third camp. This is a new area for host and his team and just a short distance from where the other camps had been held. These kids were younger, ranging in age from 8-14, with maybe one 16 year old. When the team arrived, these kids were waiting. They are younger than those in the earlier camps but were so excited to be a part of the camp. Basketball was fairly new to them, so the coaches adapted what they expected the kids to do. They stopped often for a juice and water break. These kids generally get one meal a day, and that’s dinner. So they had not eaten anything and were giving it all they had. You’ll see a pic of Joey’s team of boys all laying on the court during team time. They had no energy. When the team returned for the afternoon camp, there were several young men on the court playing soccer. Julio asked them to let the kids come back to the court but they said no. So mass ball handing started on the nearby court… in the hot sun. Thankfully after about 20 minutes, the soccer players left the covered court and our group returned. Keeping the energy level of the kids up got harder and harder as the day wore on. Finally it was the end of a long day for little kids who eat one meal a day, and leave camp to go to work looking for recyclable material. Some girls had to leave after the morning camp to go make tortillas, but made sure their coaches knew they would be back in the morning. They want their basketball! Shawn ran the camp entirely today, both the morning session with 43 and the afternoon session with 46. He did a great job, even though it was at times chaotic. He’s a school teacher, so I expect he knows chaotic! The coaches and fellow teammates are all heartbroken over the tragic loss of life in the orphanage fire yesterday in Guatemala City, about 45 minutes away from where they are. The team was awakened, not to the sound of a beep on an alarm, but to firecrackers going off. It’s the way the Guatemalan people celebrate birthdays and the sound can be heard for a few seconds each day, between 6:00-6:30A. Rise and shine! The breakfast menu was eggs or fruit, granola, hash browns, sweet bread, and plantains. It was again delicious. The camps went smoothly on this beautiful day. Competitions started the camp, and while the coaches were tallying scores to determine who would get the first place, second place, and coach’s awards, the translators took the kids through some shooting competitions. The energy level was high and full of excitement. The last basketball play they do on the court is Last Second Hero, and when a basket is made, the coaches and kids go wild to celebrate the win! It’s always one of the most favorite things they do on the court. After lunch of chicken or pork chop, rice, mashed potatoes, and fruit, the team headed to the site of the second camp. The head of a local non-profit organization based in Guatemala City, shared with the team about their work in the city. The afternoon camp structure was the same as the morning camp. This time in Last Second Hero, the girls outscored the boys, which was sweet! In closing, it’s so rewarding to see the faces light up when their names are called to receive an award or be presented with their certificates. The kids cheered for each other, which was precious to see. Jason led both the morning and afternoon camps today, doing a great job. Yesterday, Shawn led the morning camp, and Sarah the afternoon one. Mark appreciates being able to entrust the whistle to these future leaders, giving him a break. The principal of the school thanked the team, as did the teachers and helpers. There were lots of farewell hugs from the girls and guys, making today a good closing day of camps. Julio plans to get into the schools to start teams, ultimately forming leagues. He’d like to call the league Hoops For Hope! He is thrilled with the progress he’s seen this week partnering with us to bring hope to the community. The team was heading off to St. Martin Restaurant, a local favorite. Then it’s back to prepare for a new camp to begin tomorrow; airing balls, preparing paperwork, etc. Today was another delightful day for our Guatemala Team. After a hearty breakfast of egg burritos, rice & beans, and pancakes, Kate challenged the team to be encouraging to one another and to build each other up, which has the power to transform lives. Anyone who knows Kate knows she is a powerful encourager! Julio’s child was sick today, so one of the afternoon translators stood in for him in the morning camp. The kids had really improved today and were more confident and engaged. There were many hellos, hugs and I Love You’s as the kids interacted with the coaches, plus it gave them a chance to practice their English. The coaches are having a powerful impact. The kids knew more of what to expect from a day of camp so things went more smoothly. Coach Mark added more cross court drills and relay races, and the kids loved it! Today’s topic was the PLAN for our lives. Mark shared a story about a builder who just did what he felt like in building a gym and described a myriad of mistakes he made in its design, simply because he wasn’t following the plan. The campers listened intently to the story. Then they shared 6 pictures of design flaws with each kid and asked them to identify the problem. They enjoyed figuring out what was wrong with each one. Coaches walked the kids back to their school a couple of blocks away. Camps definitely ended on a high note today. There were 50 kids in the morning camp, an even split of 3 girls’ teams and 3 boys’ teams. This is a first. There were 54 kids in the afternoon camp, plus the PE teacher, and today the teachers sat in the bleachers and watched. Kids are learning so quickly, and in the afternoon camp, it was gratifying to see campers encourage each other. The translators are bonding well with the coaches, and the coaches are bonding well as a team. There’s lots of laughter and good times. Tonight after dinner, the team sat outside and enjoyed the beautiful cool weather while they shared stories of their other international trips. Again, lots of laughs. The food has been very good. Each meal has been delicious. For lunch they had a choice of lasagna or beef with vegetables. Dinner was pita with chicken, carrot/raisin/pineapple salad with chips. The day started with a delicious and hearty breakfast of chicken empanadas, beans, scrambled eggs, fried plantains, and chocolate rice drink. The drink was lumpy like oatmeal but it tasted good. Shawn challenged the team to be there for each other, a solid reminder as they started the week. Normally, the first day of camps is a little hectic since the kids have to learn how camp is run and become comfortable with their coaches. But today, camps were peaceful. Nothing could have prepared the team for these kids. They are brought to the schools where the camps are run. Their typical routine is to go to work sorting through recycled items to raise money for their families after school. So when they arrived for camp instead, they were absolutely thrilled. Mark’s word for the day was SMILES. The coaches were touched by the genuine smiles on the faces of those young kids. They were orderly, listened well, and had a blast. There was great interaction with the coaches and translators and the kids caught on quickly. The coaches did a great job relating to the kids and keeping a high energy level. The translators were awesome too! They are fully knowledgeable about sports and what we hope to accomplish in the camps each day. Even though the kids’ skill level is low, the translators motivated with high energy and stayed involved with the kids. The camps went so well that they ended a little earlier than normal, probably a first. The kids doubled up on contests which was a lot of fun, but it also saved some time. Today’s focus was our purpose. The kids listened intently, but were not used to sharing. However, some asked their coaches great questions. The schools there have had these kids for 13-14 years (some kids were 20 years old). Leadership is convinced that if the schools were not there, the kids would get no education at all. So our work there is to tell the kids just how special they are, and to solidify the work that’s already in place. It’s also good to see the translators get loved on so much. The principal of the school where the morning camp was held wanted to show the team around .By the time they got back to the seminary for lunch, there was a long line. So once they finished their lunch of beef steak & rice with a salad, they took off to the site of the afternoon camp, which was delayed by 30 minutes. But the kids didn’t mind. They were patiently standing in line. After a delicious dinner of ham & cheese lasagna, tortilla soup, salad and a powdered brownie for dessert, everyone headed off to bed to rest their tired bodies. Even the translators were tired, commenting that they were not used to doing 2 camps in one day. There were 49 kids in the morning camp, and 53 kids plus 1 PE teacher in the afternoon camp. It was a great, peaceful, first day. They are grateful for the beautiful weather; cold enough for a jacket in the morning, and reaching the low 80’s in the afternoon. The team arrived safely last night in Guatemala at 11:00P and were checked into their lodging with all their luggage a little after midnight. We are grateful for their safe journey. After a good night’s rest, and hot showers this morning, (except for the boys who had no hot water) the team met for breakfast of 2 eggs sunny-side up, rice & beans with hamburger, pancakes, bread, corn flakes and fruit juice. It felt good to be there with Julio, our host, and his team. Sarah challenged the team to have a heart of compassion, which must be foremost in their minds as they interact with the kids and work closely together this coming week. Julio’s community of friends and family has moved around a good bit trying to find a place of their own when they were offered a warehouse to purchase, which they gladly did. They’ve been there for 4 months and have been working hard at settling in. They’ve added bathrooms and a children’s section and will continue to make it their own. The team traveled to the local cemetery, an interesting site. Instead of being buried 6 feet under as is our custom, their departed are buried in caskets stacked one on top of another. These cemetery blocks are hundreds of yards long and maybe 10 yards wide. The cemetery backs up to the dump, where until recently, three and four generations of families have lived. Because of serious health hazards, the occupants of the dump have been banned to living on the sides of it. They see dump trucks coming into the 24-football-sized fields to unload and kids quickly start digging through the debris with their sticks for utensils, dolls, food, anything of value. The country is divided by extreme poverty and extreme wealth. When the wealthy throw out their trash, there is likely something of value to claim. The stench is just as bad as you would expect. There were hundreds of buzzards feeding on death. A local group takes the kids out of the dump to the country and fresh air once a month. After being away from the dump for a couple of hours, the kids ask where the flies are. Flies are such a part of their daily lives. What a sobering experience. The team then traveled to the 7-story Oakland Mall to walk around for a while. They ate lunch at a local Guatemalan restaurant, enjoying an array of meals like quesadillas, enchiladas, tacos, nachos. Yum. The sauces offered ranged from 1-10, with 1 labeled for wimps, and 10 labeled why did you do that to me. It was great to get to know Julio and the team they will work with next week. When they returned to their lodging, they watched a documentary about the people of the dump, which gave them insight into the kids who will come to camps this week. This would help prepare them emotionally. After sandwiches for dinner, the team prepared practically for camp by airing balls and getting all supplies ready. They will travel to 2 sites tomorrow for camps, starting at 9:00 in the morning. The team is tired, but feeling good. They are excited about meeting their campers in both the morning and afternoon camps and look forward to making quick connections. 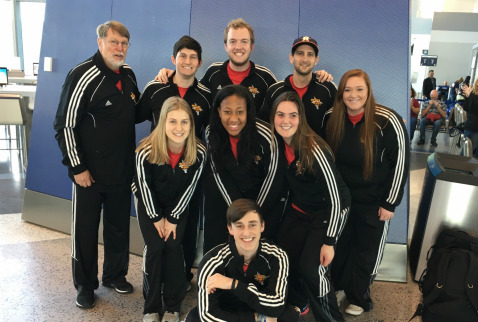 We are excited the team is ready to fly out of Houston to Guatemala City in just a little. They will work with a local organization to hold basketball camps there next week. We are asking for safe travel, for all their luggage to arrive, for good health, and a great connection with the kids early on.